‘Open Bethlehem’ is a political campaign which describes its aim as being “to address the state of emergency in Bethlehem”. Partnered by the Amos Trust, promotion of its campaign message is largely focused around a film of the same name made by Leila Sansour. Bethlehem of course has not been “under occupation” for two decades and neither is it ‘encircled’ by a “concrete wall” but readers no doubt recall that same theme being promoted by the BBC’s Yolande Knell exactly a year ago in her Christmas reporting from Bethlehem and yet again in her reporting on the Pope’s visit in May 2014. Now, what would the BBC’s editorial guidelines on impartiality have to say about the self conscription of a BBC correspondent to a political campaign directly connected to the field she covers? 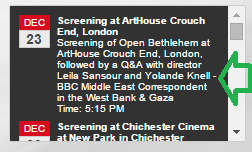 Whether or not Yolande Knell got the required permission from her Head of Department before agreeing to allow her name and BBC brand-linked title to be used for promotion of the ‘Open Bethlehem’ film we do not know. What is clear, however, is that her position as an ‘impartial’ BBC correspondent based in its Jerusalem bureau is compromised and indeed untenable after such political activity. Great revelation, Hadar. As you say, Knell’s position would seem now to be untenable. Another great evening at a packed Crouch End cinema. This time the Q&A was chaired by BBC Middle East correspondent Yolande Knell with whom I bonded three years ago over Yorkshire tea which had to be carefully rationed in Bethlehem as there were limited supplies of it in town- basically, her cupboard and mine. Time to take away BBC’s accreditation. I will continue to make this appeal until I am heard. I know about Democracy and Freedom of Speech but this should not cover the lies half truth’s and distortions that this Anti-Semitic News division promotes. There are plenty of other International Media Organisations – mostly not friends of Israel but they don’t stretch the truth as BBC does. There is Al Jazeera, Sky, CNN plus plus. Anybody can and should report from Israel but it has to be the truth and not those who ignore the truth in order to harm the Jewish State. The Israeli Government’s until now fail to protect Jews and Israel by their silence and holier than the Pope attitude. The media war is more important than the Military one’s which we can win in hours if Israel wants to. The Media war is all but lost as a result of Israel’s STUPID POLICY! 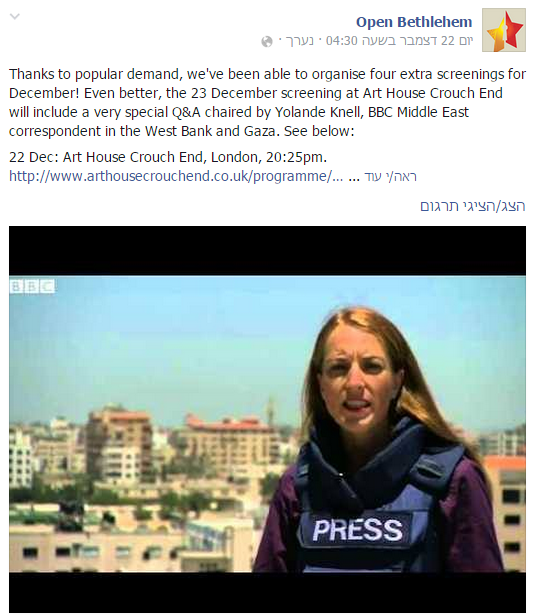 This is the pallywood mocumentary Sansour with Her heavy Russian accent was peddling at St Janes Piccadilly Xmas 2013/14. She lives in London peddling her propaganda with impunity Al jazeera being her stage.